One of my favorite things in the world is sitting in front of the television after a long day of work with a giant bowl of chicken noodle soup. This is especially true when the temperature outside begins to drop. There is nothing more consoling than slurping on soup while watching The Walking Dead. Are you judging me right now? I can feel it. You are judging me. I promise I’m not slovenly. I use a napkin, slurp with spotlessness, and never take a glug directly from the bowl. Okay, maybe sometimes I glug directly from the bowl. This quick and easy Chicken Meatball Noodle Soup tastes almost like pizza. It is oh so very Italian with artichokes, fennel seed, and oregano. Being gluten and dairy free can be daunting at classic Italian restaurants. If you are like me and simply miss eating pizza from time to time (who doesn’t love ooey gooey cheese pizza with a paper thin crust?) then try a bowl of this. Preheat oven to 400 degrees. In a large bowl, mix all of the meatball ingredients until just combined (don’t overmix); form in to ½ inch sized meatballs. On a large sheet pan lay out meatballs being sure they don’t touch. Spray quickly with olive oil. Bake until golden brown, about 15 minutes. Set aside. Heat olive oil in a heavy soup pot on medium high heat. Add onion, oregano, rosemary, salt and pepper. Cook until onions are translucent; about 5 minutes. Add drained artichokes, tomatoes, and spinach; stir to combine. Add chicken stock; bring to a boil. Reduce heat to low. Add chicken meatballs and parsley. Prepare brown rice noodles according to package directions. I usually soak them in very hot water while I cook the other ingredients; about 15 minutes (no need to boil). Drain and set aside. Note: Keep the noodles separate. Simply add a serving to the bottom of the bowl, and pour a serving of soup on top. This keeps the noodles from getting soggy and soaking up all of the lovely broth. This sounds great and I want to try it next week, as it's unseasonably warm here today and snow is forecast for next week. All the spices in this are wonderful! Thanks! This looks awesome! 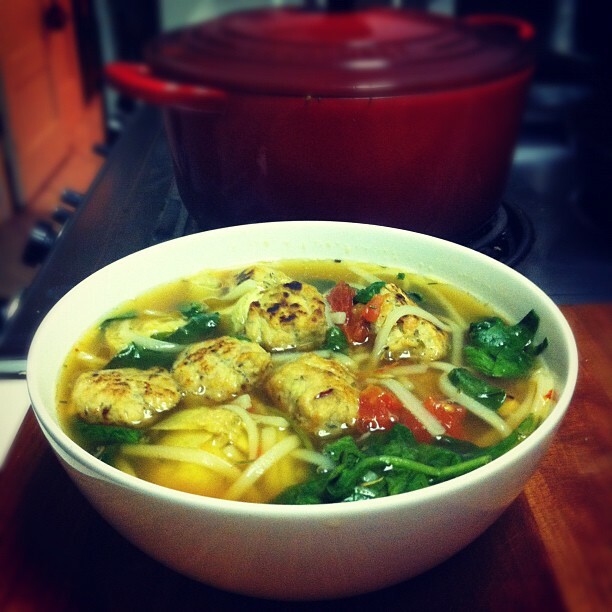 I love noodle soups, and the chicken meatballs look fabulous. Will give this a try for sure. Thanks! the chicken meatballs make this soup super comfy. Let me know if you like it. At first glance I thought these were matzoh balls! I love the chicken ball idea, and that you put fennel in it. Perfect winter soup flavor! They do look like matzoh balls! Alas, they are chicken...and they taste like Italian sausage from the fennel. Nom. I completely agree with you! Giant bowls of noodle soup with an epic TV marathon have become a weekly ritual in my flat! I can't wait to surprise my OH with a bowl of this! Yes! Long live soup/tv marathons! This sounds like such a comforting soup! So many things to love about this soup...first of all meatballs...and then artichokes!!! Wow! This gorgeous soup invites glugging from the bowl, my friend! I love the little chicken meatballs, though I'd probably use a spoon to fish these out to eat before glugging. once I had tried mutton soup taste was too yummy. It seems too similar, but the recipe is different. Surely would try this. Oh I could do with a bowl of this right about now! looks lovely. Awesome recipe - my only amendment would be fresh cherry tomatoes instead of canned ones...other than that delicious!